In the center of the Gibson House kitchen stands a table with a few objects on it, including a cookbook currently turned open to a page detailing various recipes for jumble, a ring-shaped cookie or cake. This cookbook is the 1905 edition of the White House Cook Book by Mrs. F. L. Gillette and Hugo Ziemann. The title page describes the cookbook as “A comprehensive cyclopedia of information for the home, containing cooking, toilet and household recipes, menus, dinner-giving, table etiquette, care of the sick, health suggestions, facts worth knowing, etc.” Wondering what “toilet recipes” entail? As it turns out, homemakers could mix together natural ingredients for almost any personal care or beauty aid they might have needed: “hair invigorator, lip-salve, and instantaneous hair dye” are but a few of the toilet recipes in the book. Fanny Lemira Camp Gillette, the author of the original White House Cook Book, first published in 1887, was from Wisconsin and never lived in the White House—and likely never visited Washington, D.C. She was ingenious, however, because her White House cookbook, which was less than loosely based on White House practices, became America’s best-selling recipe collection. According to culinary historian Susan Williams, the major growth in the publishing industry that took place in the late nineteenth century “produced a multitude of cookbooks and household manuals to guide the American housewife ‘scientifically’ through the complex tasks of food preparation for family and guests.” In tandem, the effects of the Industrial Revolution created a new American middle class whose women found a surplus of time to spend on fine dining recipes. They looked to the pinnacle of high society for guidance and picked up F. L. Gillette’s White House manual in greater and greater numbers. The success of the cookbook piqued the interest of the former White House steward to Benjamin Harrison, Hugo Ziemann, at the turn of the twentieth century. In 1905 he collaborated with Mrs. F. L. Gillette on an updated edition of her book. Ziemann produced several pages of real White House recipes and dining tidbits, legitimizing the title of the book and keeping it in print for another few decades. This version is the one that the Gibson House cook acquired. Fanny Lemira Camp Gillette died in 1926 at the age of ninety-eight, having amassed a respectable sum from her book sales. Interestingly, her son, King Camp Gillette, gained even greater fame and fortune from his own enterprising efforts, mostly notably, his invention of the Gillette Disposable Razor Blade. Josh and Brent, “Eat (Sort Of) Like a President,” Beekman 1802. February 15, 2013. https://beekman1802.com/recipes/eat-sort-of-like-a-president/. “Ushers and Stewards Since 1800,” White House Historical Association. 2009. https://www.whitehousehistory.org/ushers-and-stewards-since-1800. Williams, Susan. Savory Suppers and Fashionable Feasts. Knoxville: University of Tennessee Press, 1985. Last month, museum docent Timothy Spezia wrote his final blog post on Dr. John Collins Warren, grandfather of Rosamond Warren Gibson, and his groundbreaking use of ether in 1846. Coincidentally, while walking through the Boston Public Garden a few days ago, I happened to notice a monument in the northwest corner. I had seen it before but never thought anything of it; compared to the grand equestrian statue of George Washington amongst the flowers nearby, this monument is more subdued under the shade of trees. Upon further inspection, and much to my surprise, the structure revealed itself as the 1868 Ether Monument. The Ether Monument does not memorialize one person, but rather the historic MGH operation when dentist William T. G. Morton assisted John Collins Warren in using ether as an anesthetic for the first time. Atop the granite tower kneels the Good Samaritan aiding a wounded stranger. The tower’s four sides feature an assortment of scenes and inscriptions illustrating medically relevant themes. The monument’s status as the oldest in the Garden—preceding the George Washington statue by one year—makes it evident that Bostonians highly valued this medical advance and took pride in the historic operation. 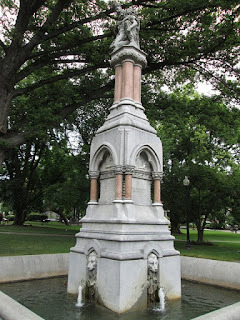 The Ether Monument, which is not far from the Gibson House, commemorates a valued contribution made by a Gibson relative to Boston, the United States, and the world. On the other side of Charles Street, on the Boston Common, stands another Gibson family–related structure: one that became shrouded in controversy despite its planners’ good intentions. 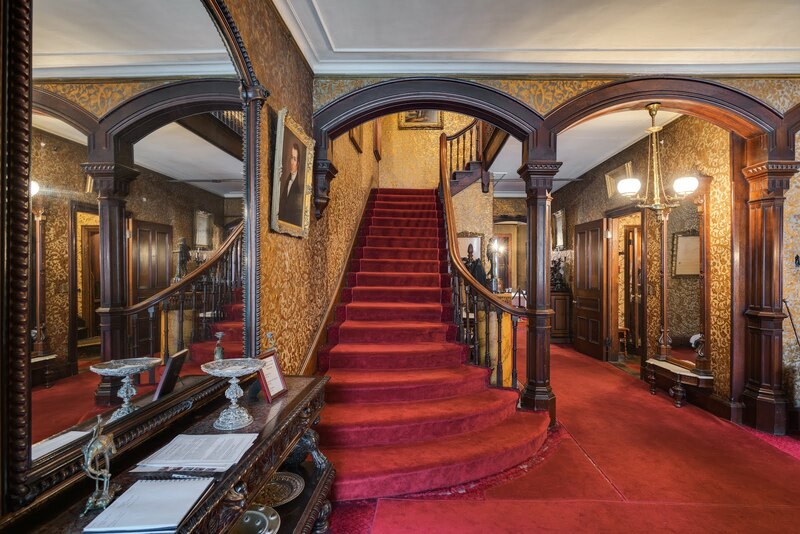 The building on the Common is a “convenience station” whose construction was overseen by Charles Gibson, Jr., this museum’s founder, while he served as a volunteer commissioner of Boston’s Park and Recreation Department from 1914 to 1916. What should have been a straightforward task proved a massive headache for all involved. Plans for a new Boston Common convenience station had been in the works since 1910. After three attempts at finding a suitable location, the Park and Recreation Department finally landed on the Common’s Flagstaff Hill, where there was already an old wooden sanitary structure. Charlie and his fellow commissioners employed architect G. Henri Desmond to design plans for a new station. Desmond’s decision to model the station on the Petit Trianon at Versailles is what ignited the controversy. In general, opponents, with the city’s Art Commission at the forefront, decried the use of such high architectural design for a glorified men’s bathroom. Mayor James Michael Curley finally suspended work on the convenience station amidst the mudslinging. Eventually, construction started up again on Charlie’s convenience station, and the controversy died down. As of 1945, the Flagstaff Hill convenience station was one of three on the Common. For a few decades before 2012, the building stood abandoned and locked up to the public. That year the Earl of Sandwich fast-food chain gutted the structure and turned it into a place of utility once more. No longer known as “Gibson’s Folly” or “the temple,” the inconspicuous building next to the Parkman Bandstand now rarely induces a second glance. If only passing Bostonians knew how up in arms their forebears were about a Beaux Arts bathroom corrupting the sacred Common. Architectural Review, January 1916, https://books.google.com/books?id=rqNAAQAAMAAJ&pg=PA13&dq=boston+society+of+architects+jan+1916+convenience+station&hl=en&sa=X&ved=0ahUKEwjDuZ2Rg5nNAhUCpB4KHTnlD58Q6wEIIzAB#v=onepage&q=boston%20society%20of%20architects%20jan%201916%20convenience%20station&f=false. “Charles Hammond Gibson Dies, Poet, 79, Was ‘Proper Bostonian,’” Boston Herald, November 1954, Charles Gibson, Jr. Personal Papers, 1954, Gibson House Archives. Gibson, Charles Jr., “Response to ‘Gibson vs. Art Board,’” January 20, 1916, Charles Gibson, Jr. Personal Papers, 1916 M, Gibson House Archives. “Gibson vs. Art Board,” Boston Herald, January 1916, Charles Gibson, Jr. Personal Papers, 1916 M, Gibson House Archives. Keyes, James M., Letter to the Parks and Recreation Department, January 21, 1916, Charles Gibson, Jr. Personal Papers, 1916 G, Gibson House Archives. “Reports and Communications” (Boston Finance Commission, 1916), https://books.google.com/books?id=fMpJAAAAMAAJ&dq=convenience+station+boston+common&source=gbs_navlinks_s. “Sculpture & Memorials,” Friends of the Public Garden, accessed June 10, 2016, http://friendsofthepublicgarden.org/our-parks/public-garden/sculpture-memorials/.